Steel is one of the crucial raw materials used in the production of several products essential for growth of the economy. These include vehicles, electric appliances, industrial machinery, and construction products. Steel can be converted into several forms to facilitate its use in different products. These products can be broadly categorized into flat steel products and long steel products. As the name suggests, flat steel products are continuous or discrete sheets, coils, plates, and flat slabs made of steel. Long steel products include long bars, tubes, pipes, profiles, and sections. Based on alloying element, steel can also be classified into carbon steel, stainless steel, and special/engineering steel. One of the most prominent applications of flat carbon steel lies in the building & construction industry. Rapid industrialization, increase in investments in infrastructure, and rise in global population are major factors driving the building & construction segment of the flat carbon steel market. Machine manufacturing was a lucrative application segment of the global flat carbon steel market in 2017. Growing imports of machines such as agricultural equipment in developing economies such as Thailand, India, and Vietnam are boosting the demand for flat carbon steel in the machinery manufacturing segment. Other application segments such as automotive & transport, appliances, and energy are also expanding. The transportation industry is a significant consumer of flat carbon steel. Increasing demand for flat carbon steel from automotive, marine, railways, and aerospace sectors is expected to promote growth of the global flat carbon steel market during the forecast period. Though use of flat carbon steel in the aerospace sector is low and the automotive sector is inclining toward use of more lightweight materials, the demand for flat carbon steel in railways and marine sectors is projected to remain high during the forecast period. The automotive sector is witnessing rise in the demand for steel that can reduce weight of automobiles. This is another factor boosting the global flat carbon steel (FCS) market. Based on product, the flat carbon steel market can be segmented into plates, hot-rolled coils, cold-rolled coils, galvanized coils, pre-painted steel coils, and tinplates. In terms of revenue, hot-rolled coils is a highly attractive segment of the flat carbon steel market. Hot-rolled sheets are suitable for automobiles and electric appliances, owing to their strength and durability. The pre-painted steel coils segment is expected expand at a substantial growth rate during the forecast period. This is primarily due to the rising demand for high-quality steel with aesthetic appeal in automotive and construction industries. Demand for flat carbon steel plates is expected to increase moderately during the forecast period. Rising construction activities across the globe are expected to boost the segment during the forecast period. Galvanized coils are coated steel products, wherein coating is carried out through electrolysis in order to protect the metal from corrosion. The most commonly used coating material is zinc, which can be applied either by using the heat process (hot-dip galvanizing) or electrolysis (electro-galvanizing). Galvanized steel is also a lucrative product segment of the flat carbon steel market across all regions. Corrosion resistance and better durability are propelling the demand for galvanized steel. In 2017, Asia Pacific was the leading market for flat carbon steel across the world. Consumption of flat carbon steel is concentrated predominantly in manufacturing and production hubs in the region such as China, India, Japan, South Korea, and Taiwan. The Asia Pacific flat carbon steel market is witnessing significant growth, due to increasing demand for flat carbon steel from various end-user industries in developing economies in the region. The flat carbon steel market in India is projected to expand at a significant pace during the forecast period, due to growth of the country’s economy, rise in urban population, and growth of industries such as construction and automotive in the country. North America, spearheaded by the U.S., is expected to witness high increase in the consumption of flat carbon steel during the forecast period, owing to rise in repair activities in building & construction and infrastructure industries. In addition, growing interest in replacement of old, wooden poles installed for electricity distribution with poles made of steel is likely to propel the market in the U.S. from 2018 to 2026. Companies are continuously adopting the strategy of enhancing their geographical footprint through capacity expansion, introduction of new products, and expansion of end-use portfolios. The global flat carbon steel market is dominated by a few large-, medium-, and small-scale companies operating across the world. ArcelorMittal S.A. held a prominent share of the global flat carbon steel market in 2017. The company’s success can be primarily ascribed to its constant efforts toward technological innovations and its wide product portfolio. Market players have been adopting mergers & acquisitions, expansion, and agreements & partnerships as their key strategies over the last few years. For instance, in February 2017, ArcelorMittal entered into a joint venture with Cellino Group to manufacture steel products for sectors such as agricultural & construction equipment, trucks, and energy. Some of the other major players operating in the global flat carbon steel market include China Baowu Group Ltd. Corporation, Nippon Steel & Sumitomo Metal Corporation, and POSCO Steel. The market in Asia Pacific is expected to expand at a significant CAGR during the forecast period, owing to growth of construction and automotive industries and presence of prominent players in the region. Additionally, increasing exports of flat carbon steel from developing countries such as India is driving the market in the region. 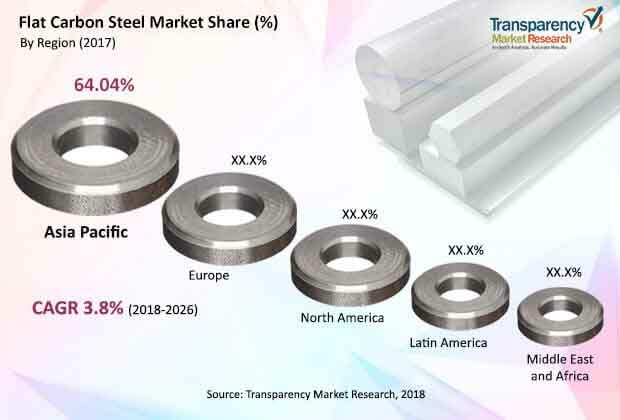 The flat carbon steel market in North America and Europe is expected to expand at a rapid pace during the forecast period, owing to rise in automotive production output and government initiatives for repair and refurbishment activities in the construction sector. Among applications, building & construction was a prominent segment in 2017 and it is expected to expand at a significant pace during the forecast period, due to high demand for sustainable, durable, and cost-effective materials. Rapid industrialization, increase in investments in infrastructure, and rise in global population are major factors driving the building & construction segment of the global market. Machine manufacturing is a lucrative application segment of the flat carbon steel market. Companies have been trying to improve competitiveness by optimizing existing processes and developing new processes to reduce the environmental impact, improve quality, and reduce costs. Key players operating in the global flat carbon steel market include ArcelorMittal S.A., Baosteel Group, NSSMC Group, POSCO Steel, JFE Steel Corporation, and Nucor Corporation. Companies are continuously adopting the strategy of enhancing their geographical footprint through capacity expansion, introduction of new products, and expansion of end-use portfolios. For instance, in 2017, Zhanjiang Iron & Steel Co., Ltd, a subsidiary of Baowu Steel Group Corporation Limited, opened its production line for special silicon steel and carbon steel. This would help the company increase its production capacity and serve its customers in a better manner in the next few years. Production of flat carbon steel is highly capital-intensive, which creates high entry barriers for new entrants. High production costs result in high costs of end-products and relatively low profitability. The report analyzes and forecasts the market for flat carbon steel at the global and regional levels. The market has been forecast in terms of volume (Million Tons) and revenue (US$ Bn) from 2018 to 2026. The study includes drivers and restraints for the global flat carbon steel market. It also covers the impact of these drivers and restraints on the demand for flat carbon steel during the forecast period. The report also highlights opportunities in the flat carbon steel market at the global and regional levels. The report comprises detailed value chain analysis, which provides a comprehensive view of the global flat carbon steel market. The Porter’s Five Forces model for the flat carbon steel market has also been included to help understand the competition landscape. The study encompasses market attractiveness analysis, wherein application segments are benchmarked based on their market size, growth rate, and general attractiveness. The study provides a decisive view of the global flat carbon steel market by segmenting it in terms of product, application, and region. These segments have been analyzed based on the present and future trends. Regional segmentation includes the current and forecast demand for flat carbon steel in North America, Europe, Asia Pacific, Latin America, and Middle East & Africa. The report also covers the demand for individual applications in all regions. The study includes profiles of major companies operating in the global flat carbon steel market. Key players profiled in the report are Baosteel Group, Manshaan Steel, Shandong Steel, JFE Steel Corporation, Gerdau S.A., Evraz Group, Hyundai Steel, MMK Group, NSSMC (Nippon Steel & Sumitomo Metal Corporation), SAIL (Steel Authority of India Limited), Nucor Corporation, and Shagang Group. Market players have been profiled in terms of attributes such as company overview, business strategies, recent developments, and financial details. The report provides the estimated market size of the flat carbon steel market for 2017 and forecast for the next nine years. The size of the global flat carbon steel market has been provided in terms of volume and revenue. Market numbers have been estimated based on product, application, and region. Market size and forecast for each product and application segment have been provided for global and regional markets. The report comprises detailed pricing analysis with respect to product and region. It includes regional and county-level production output scenario.